When Ashley Diamond envisioned herself helping out a fellow runner last Sunday she thought it would be along the course of the New York Marathon, the race for which she and nearly 40,000 other runners had spent months training. Instead Diamond, an influential blogger in the tight-knit New York running world, found herself in front of a computer, still helping a fellow would-be marathoner but in a very different way. Diamond, 28, logged on to Target.com to help Jen Correa of Staten Island, New York, who was also planning to run the marathon but instead found herself homeless and left with nothing after superstorm Sandy decimated her neighborhood last week. The "wedding registry" Diamond created for Correa had nothing to do with weddings, however, and everything to do with what more and more people are doing in the aftermath of Sandy: trying to help those devastated by the storm. "I was expecting Target to have a housewarming or new home registry and when I only saw 'wedding' or 'baby,' I thought I would just go into the wedding because I knew the items they'd suggest would be similar items," Diamond said. Diamond renamed the registry "Jen and Pedro's Rebuilding Registry," after Jen and her husband, Pedro, an Iraq war veteran who stayed behind and narrowly survived the storm while Jen evacuated with the couple's two young children, ages 2 and 7. "Registries are everywhere and have everything on there and allow people to choose things of all prices," Diamond said. "I listed their wedding date as Christmas Day and went to the top sellers, within a reasonable price point, and figured if it was a top seller and the ratings were good I would add it to the registry." The idea to create a gift registry for the Correas came to Diamond, appropriately enough, while she was out on a run with her husband, Bo, who was also planning to run the marathon last Sunday. They saw it as a more tangible alternative to the fundraising site the family's friends had already created. "This is finally a way that when someone buys it online they'll [the Correas] start getting things in the mail the next day," she said. "And, for the Correas, can you imagine a child who has nothing being able to open a box and have a princess or, for her son, to have a Mario wall decal, because that's something from his room that doesn't exist now?" A wedding registry's direct impact also appealed to a trio of volunteers with Occupy Sandy, an Occupy Wall Street-offshoot created to help Sandy's victims. The three 25-year-old Brooklyn residents built their own "wedding registry" for Sandy's victims after spending a day volunteering in the field. "We realized that they [Occupy Sandy organizers] knew exactly what they needed and just weren't getting it quickly enough so we thought a wedding registry would give them exactly what they needed," said Katherine Dolan, who created the registry, along with with Alex Nordenson and John Heggestuen. Instead of wedding items like china and monogrammed towels, the Occupy Sandy registry lists items like cleaning supplies, blankets, flashlights and shovels. Forgoing the wedding fluff, the registry lists the couple's style as "warm and non-perishable" and says that the couple has requested that the gifts not be gift-wrapped. Buyers can ship the items directly to a local church in Brooklyn now serving as a hub for Occupy Sandy volunteers. "The first delivery came this morning and there was over $3,000 worth of products," Dolan said. "It's going to be weeks of recovery so we're going to keep up with it." Diamond says the outpouring she has received from her single blog post Monday announcing the registry is also unlike anything she has ever seen before. From the time that Diamond told Correa of her efforts, to the moment when Correa got to her sister's home and was able to view the registry, everything listed had been purchased. "Monday was the highest traffic day I've ever had on my blog," Diamond said. "I think when they [donors] can really put their donation and their money with a face and a family it just gives them that extra incentive. They love that they know exactly where their donations are going." The Minneapolis-based Target, which announced last week it had donated $500,000 in money and products to assist with Hurricane Sandy relief efforts on its own, did not reply to a request for comment placed by ABCNews.com as of this writing. Amazon.com also did not reply to a request. "This is an example of social media and things that didn't exist a few years ago can do so much good in the world," Diamond said. "The thing that made me just feel so phenomenal is that the blog community, you feel like it's a small tight-knit community, but you realize how big it is." The Correas, who at first had the registry gift items sent to Jen's sister's home, now also have a place to house the generosity of others, in their new, temporary rental home. "I got a text last night at 9:30 from Jen saying, 'I'm so excited to have four walls. There may be no gas and no heat but there are four walls. And it's really easy to move when all you have is two air mattresses,'" Diamond said. For more information on the "Jen and Pedro Rebuilding Registry," click HERE. 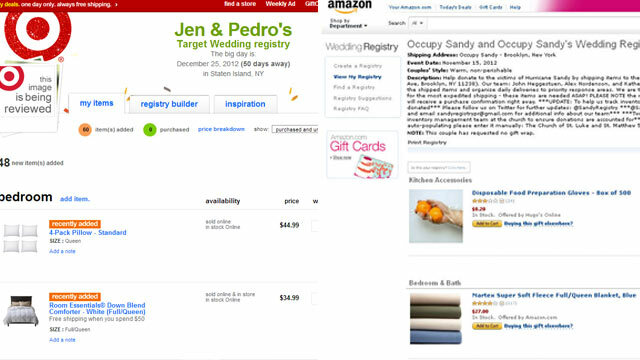 For more information on the "Occupy Sandy Wedding Registry," click HERE.